Something about Thanksgiving always makes me crave apple pie. I’m pretty sure it’s because I grew up eating the best Homemade Apple Pie ever thanks to my mom. I’ve adapted her recipe multiple times to create my apple pie cookies, cupcakes and mini pies. 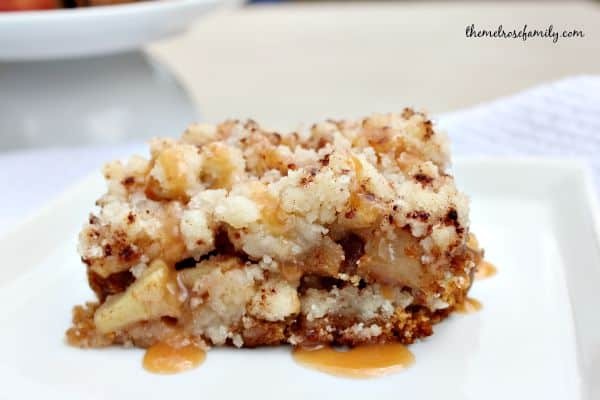 I’ve definitely gone and done it again for these Caramel Apple Pie Bars. It’s all about the comfort of home for the holidays. 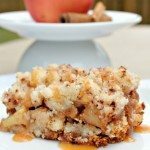 These caramel apple pie bars are easier than making apple pie because you don’t have to worry about creating a pie crust for them. I always feel that a pie crust isn’t always worth the effort because it doesn’t add any flavor to the dessert. That’s not the case with these apple pie bars. If you use cinnamon sugar graham crackers, it adds a little extra something sweet to the overall taste of the bar. Now that I’m living in North Carolina the holidays make me crave the comforts of home even more. It’s difficult being so far from my family, but I love that I can carry on a tradition of comfort with my girls and my husband. It’s as if those bars breathed a bit of my mom into the room and it doesn’t seem quite as long until my girls will be able to hug on their grandma again. Although we are much further then we’ve ever been before, I appreciate the time that we do get to spend with them during the holidays, unlike our brave men and women of the U.S. military that are away from their families. Fortunately, there are amazing programs like the Marie Callender’s Comforts of Home Project that bring the comforts of home to those that protect America’s homes every day. By purchasing specially marked packages of Marie Callender’s meals or desserts and entering the code, Marie Callender’s will make a donation to the USO to support USO Operation Celebration™ so that you can help too. 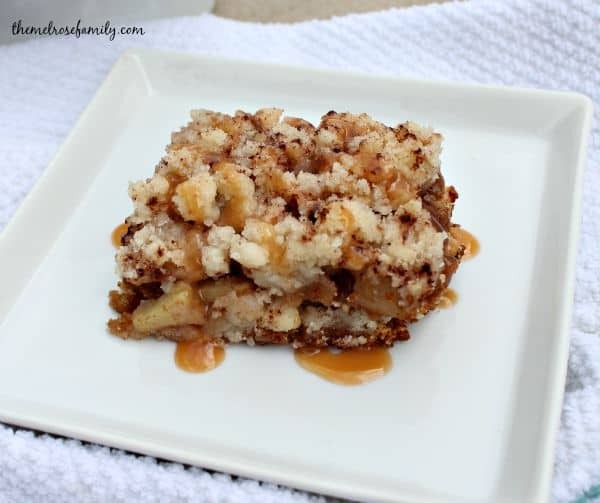 A simple, yet delicious Caramel Apple Pie Bar that is pure comfort. Grease an 8 x 8 baking dish and preheat the oven for 300 F.
In a mixing bowl combine the crushed graham crackers, vegetable oil and maple agave syrup. Press the graham cracker mixture into the greased baking dish and bake at 300 for 15 minutes. Meanwhile, in a large mixing bowl combine the apples, sugar, butter, cinnamon, nutmeg and salt. 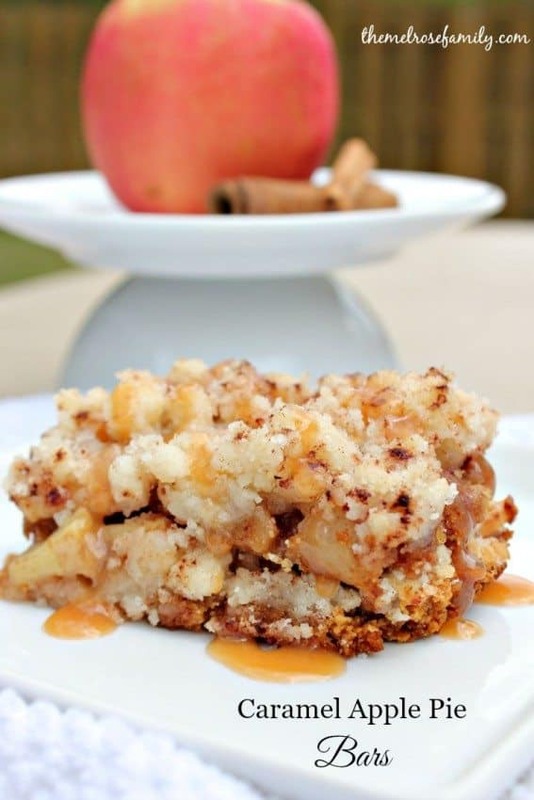 Layer the apple filling on top of the baked crust and turn the oven up to 350 F. In a small mixing bowl combine the sugar, flour, and melted butter to create the crumb topping. Layer the crumb topping on top of the filling and then sprinkle with cinnamon & sugar. Bake at 350 for 30 minutes. Allow the bars to cool before cutting them. Top with caramel syrup just before serving. What are your comforts of home? 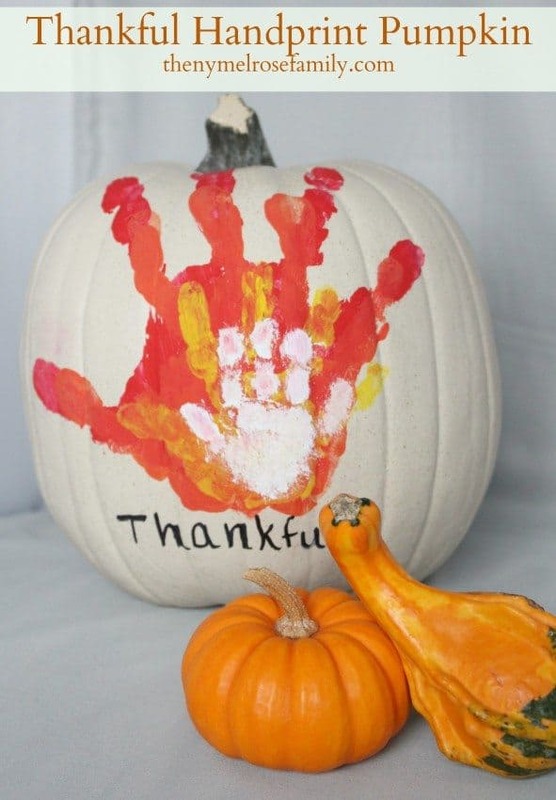 One of ours is definitely our Thankful Handprint Pumpkin that sits at our front door. Share your comforts of home photos on Marie Callander’s Facebook Page and you could see your photo featured on Food Network, The Travel Channel or HGTV on the following programs and airing times Kitchen Crashers on DIYNetwork & HGTV – Airing 11/9 and 11/14, Hello/Goodbye on Travel Channel – Airing 11/10 (new date), and Guy’s Grocery Games on Food Network & Cooking Channel — Airing 12/14 and 12/19. Plus, every photo using the #comfortsfromhome will earn $1 donated to the USO for their Operation Celebration.